My name is Sakina Shibuya. I’m an MA student in international development at American University in Washington, D.C. My academic interests are microfinance, financial inclusion, development, rural and urban poverty, economic growth, culture, values, historiography, the cold war, and the list continues. 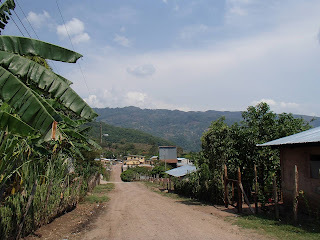 I’ll be working with Unión MicroFinanza as a summer intern until the end of July, and I would love to enter as many blog posts as possible to give you a good sense of what La Unión in the summertime looks like! Food is a vital aspect of culture, and is also a great way of introduction to a new culture. Of course, I have only been here for about a week and half. I’m certainly not claiming that I know all about the Honduran cuisine, rather I would like to share my culinary experience in La Unión. My brief research prior to travel indicated that food in Honduras is very much the same as Mexican food. Well, that was a hasty generalization in my opinion. Mexican and Honduran cuisines are certainly similar. Frijoles negros (black beans), corn and flour tortillas, carne asada and chimichanga. The names of foods probably sound quite familiar to many residents in the States due to the prominence of the Cal-Mex and Tex-Mex culinary culture. But don't be fooled by the familiarity of the names, because they could be very different from what one imagines. Let’s take chimichanga. Chimichanga is a deep-fried burrito in the States, but it is more of a simple cheese quesadilla garnished with fresh tomato, green bell pepper, and queso (hard cheese). It’s quite different indeed. There is so far only one comedor (small eatery) in town which makes this dish: Señora Anahi’s. Señora Anahi also makes, in my opinion, the best baleadas too. Baleada is pasty frijoles, avocado, and queso folded in a tortilla. Very simple, yet there is something very comforting about its flavor. 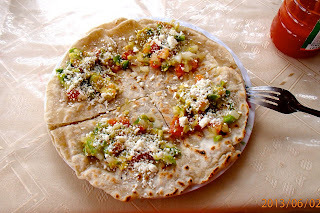 Baleada is also a very common Honduran dish. The dishes above are very tasty, and affordable; however, after a week of living in La Unión, one soon realizes that there are not a lot of food variations in the town’s eateries. I have yet to be fed up with food here, as it has only been a little more than two weeks since I arrived. However, I can certainly see how I may not want to eat any more baleadas after two months (or, as one of my colleagues has done, for forty consecutive days). I have thought a bit about why the food variety is quite limited in La Unión. From my observation, I believe one of the reasons is the remoteness or difficult accessibility of the town itself. Paved road ends about an hour and half way from here, which makes it much more difficult for trucks to come in. I believe this is especially difficult for produce transportation which requires better time management. Aha, hence infrastructure can affect local diet. I love my ‘aha’ moment. It only comes from empirical and practical learning like this, rather than my usual book studying (not to say books are not exciting, because they are). It’s more intuitive and experience-focused. It is ultimately more lingering in my memory. I’m looking forward to having many more ‘aha’ moments in coming weeks, and would love to share with all on this blog. Baleadas are delicious! You might be missing them once you leave! A wise man once said, "Enjoy every tortilla." Ask Patrick for the reference. I would like to thank you for the efforts you have made in writing this article. I am hoping the same best work https://write-my-essay.cheap/ from you in the future as well. In fact your creative writing abilities has inspired me to start my own BlogEngine blog now. Really the blogging is spreading its wings rapidly. Your write up is a fine example of it.